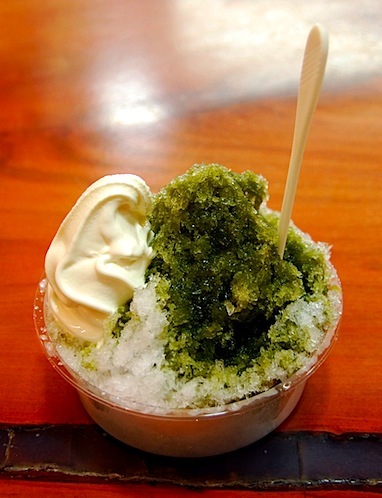 Let’s get one thing straight right off the bat: Japanese food is amazing. For any foodie whose palette prefers the fresh over the rich and the pleasure of a perfectly ripe vegetable over the heaviness of a cream sauce, Japan is your culinary heaven. (Though they do have some pretty rich dishes too…ramen, I’m looking at you…). Sure, Jeremy and I love Japanese food in the States too, but before coming to the Land of the Rising Sun, we didn’t realize just how bad the Japanese food in San Francisco was. Seriously, compared to the real thing on the other side of the Pacific, San Francisco’s Japanese food is just…sad. And limited too! 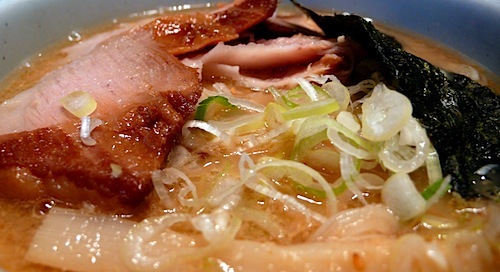 Who knew there was more to Japanese food than sushi and some salty noodles in broth? Well, we do, now. This is possibly our favorite type of meal (after sushi) in Japan. Quite simply, it’s fried stuff on sticks. 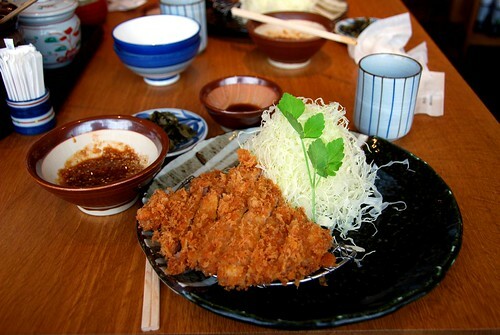 More eloquently, kushi katsu consists of vegetables, fish, and meat, rolled in panko breadcrumbs and fried to a golden perfection for not a minute too long or a second too short. On sticks. Now, this doesn’t mean that a green onion wrapped in pancetta is US$32, despite what you’ve heard about prices in Japan. Rather, this is a set menu: you start with pumpkin and wherever you stop eating, that’s what you pay for dinner (i.e., if you eat all the items listed above, you pay ¥3200). Along the way, you dip the stuff-on-sticks into a number of different sauces and spices, including parsley salt, mustard, shoyu, some sort of paprika/cayenne mix, and Worcestershire (the Japanese LOVE Worcestershire sauce!). Salad, pickles, and sliced veggies get the same dip treatment and are a refreshing source of roughage for the meal. But the star of the show is the veggies’ fried companions—Jeremy and I just can’t get over how perfectly everything is cooked. We all know how easy it is to overcook something when you’re frying it, but in kushi katsu, the veggies stay crisp and fresh inside their breadcrumb casing, and meat/fish is perfectly tender and done. And, IT’S ON STICKS. This is a pork cutlet rolled in panko breadcrumbs, and then (like kushi kastu), fried to absolute perfection. It comes with a side of finely shredded cabbage, rice, and pickles. Along with the usual shoyu and Worcestershire sauce, you also get a small mortar filled with sesame seeds, which you grind with a pestle and then dump into a sauce mixture. Said sauce mixture is them used to either flavor your deep fried pork, or to dress that finely shredded cabbage. This might be the most obvious statement ever made by (wo)mankind, but sushi is really good in Japan. We just didn’t realize how good it as going to be. Saying that the fish is like buttah is actually an insult to the fish. It’s better than butter…it’s more like eating the most perfectly clean, perfectly firm, perfectly tender, creamy, delicious piece of the ocean. And here’s the best-kept secret in Tokyo: sushi for lunch is the best deal you can get. For a few bucks more than a bowl of ramen, (about ¥1100, or US$11), you can get a gorgeous 12-piece sushi set lunch. Your taste buds and you wallet will be equally psyched. I think all we need to say about wagyu is that it’s marbled, fatty goodness. 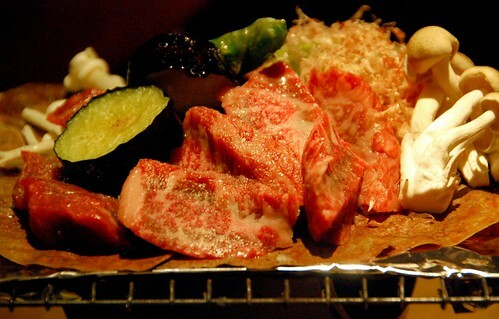 We sort of fell in love with Hida beef in Takayama…the photo above shows a special dish from the region wherein some chunks of fatty Hida beef get grilled on top of a magnolia leaf spread with miso paste. We also had some delicious Kobe in Tokyo, with fresh lime squeezed on top and dipped in salt. 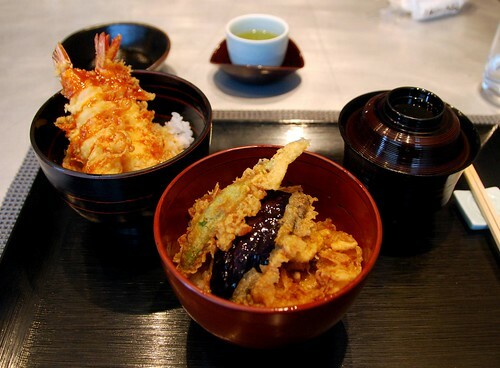 Here’s the biggest shock of them all: tempura is serious culinary business in Japan. No, really: it’s considered an art form, and it’s expensive. Any self-respecting tempura chef would want to commit some hari-kari if he saw the limp and batter-sunken veggies that we get in the States. 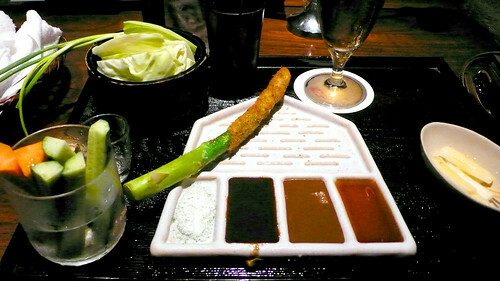 Also, you don’t just get the same old dipping sauce for every piece of tempura. Some items (like the squid I ordered), come with chili powder, salt, and lime. Others come with a curry powder as your dip. It’s all matched to the item in a way that complements the fried interior. In conclusion: blah blah blah perfectly fried. Blah blah blah crisp veggies blah. Blah tender meat and fish blah blah. Bob Loblaw. You get it, right? Once we left Tokyo (and had to pay for housing), ramen became the meal we ate at least once a day, because it’s cheap and filling. And yet, we never tired of that rich, fatty, salt-bomb. 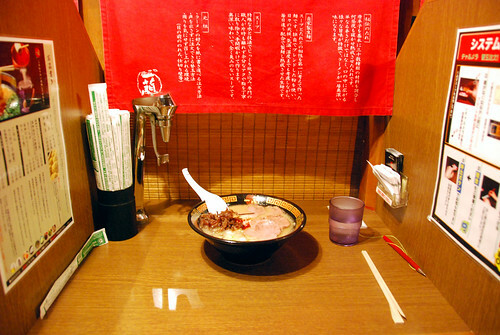 Some ramen shops let you “customize” your bowl of noodles…choosing the doneness of the noodles, the fattiness of the broth, the number of spring onions you want, and the amount of chili powder they throw in on top. Hey it’s Japan, and you can have it your way. 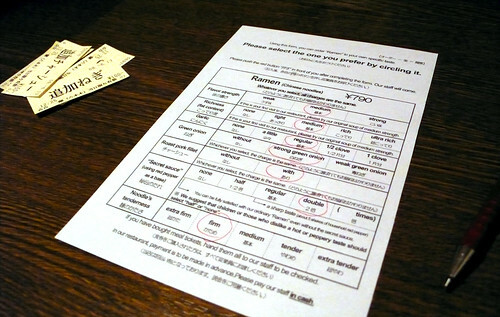 We visited a ramen shop in Tokyo where each diner was given a questionnaire when they sat down in their eating booth (imagine an exam stall or a phone booth). It felt like we were taking a ramen test! Spoiler alert: we passed with flying colors. Even if you don’t get to customize all the different elements of your ramen bowl, you can at least choose the broth. 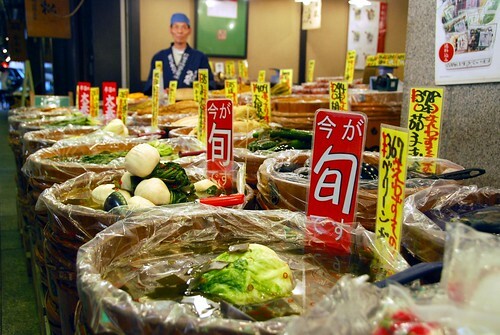 Most self-respecting ramen shops have at least four kinds: shio (salt), tonkotsu (pork bone), shoyu (soy sauce), or miso. By far the best bowl of ramen we had was at Santoka in Kyoto. I had the shoyu broth and Jeremy had the shio…but what made this bowl of noodles a standout was the fatty pork cheek meat. Yes, I said pork cheeks. You can wipe the drool off your keyboard now. If kushi katsu was our favorite dish (after sushi, which is in a category all it’s own), then izakaya is our favorite type of meal. If ramen is the dish you eat at 3AM after a night of drinking sake, then izakaya is what you eat while you’re drinking said sake. 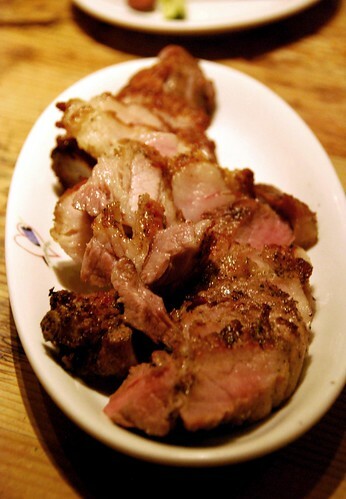 Basically it’s pub food, but of course, the Japanese take it to a whole other level, with inventive dishes like pork stew drizzled with radish puree, or sesame tofu. Homemade sesame tofu. 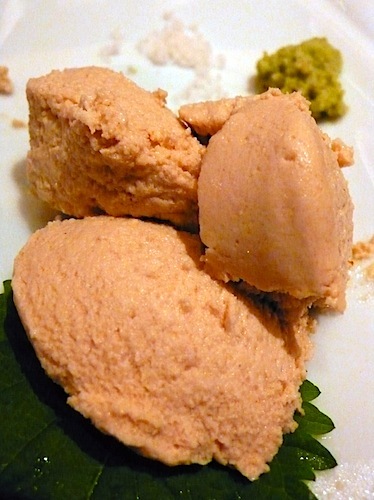 Eaten at a fantastic restaurant that may or may not be called Ichi (website is in Japanese, so I can’t tell). 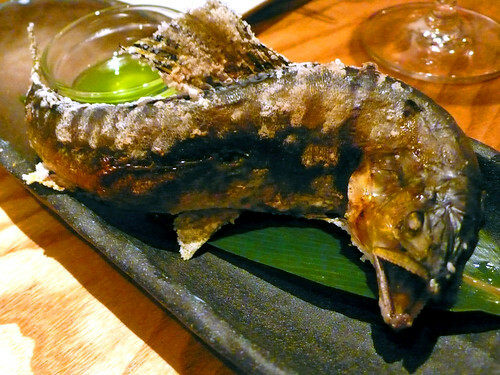 Deep-fried fish, impressively presented. Eaten at yet another amazing izakaya named Kinsai. OK, this is just a plate of roasted pork, but we were so impressed with the size of this dish, I just had to include this picture. Eaten at Vinpicoeur. 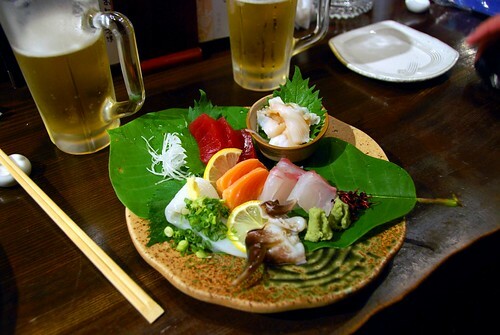 The point is, it’s varied (so you get to taste a bunch of different stuff), it’s good, and you wash it all down with a cold beer, a shot of sake, or (Joy’s favorite drink) a glass of plum wine mixed with soda water (very refreshing!). 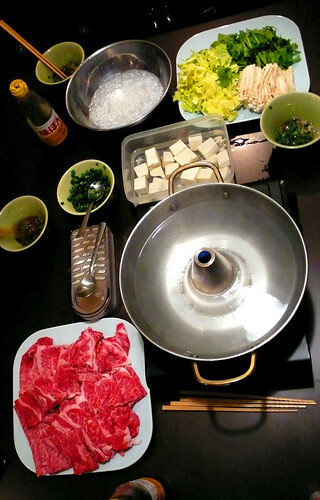 I grew up eating Taiwanese-style hot pot for holiday dinners, but I have to say, shabu shabu is different. First of all, the ingredients are cooked in stages: the meat is thrown in the pot first, in order to create a soup base for the vegetables, noodles, and tofu (in Chinese/Taiwanese hot pot, you just throw everything in all at the same time). 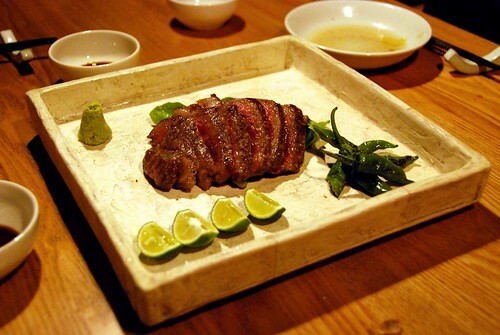 Second, the meat used is super fatty wagyu beef, which creates a rich, delicious broth very quickly. And finally, instead of dipping your boiled goodies in a raw egg and soy sauce mix (like you do with Taiwanese hotpot), Japanese people grate a radish and add Ponzu sauce as their dipping mixture. I have to admit…Taiwanese hot pot will always hold a special place in my heart, but on taste alone, I think I might prefer the Japanese version (eek…don’t tell the Taiwanese food police!). In a fit of complete decadence, we ate the above meal as a second dinner in Joy’s apartment while simultaneously watching Tampopo. Is it possible to get more gluttonous? I think not. It’s a pickle. On a stick! Taken in Kyoto, Japan. Japan is famous for it’s Kyoto candies, but we hear they’re usually not actually very good (just pretty). 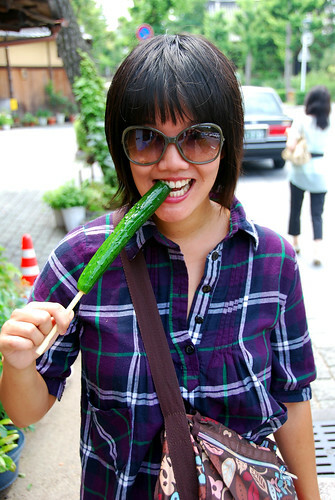 In general, Asians prefer much less sugar in their desserts than Americans do (growing up, the biggest compliment my family could give to a cake was “it’s not too sweet!”). So, Japanese desserts were perfect for my tastebuds. 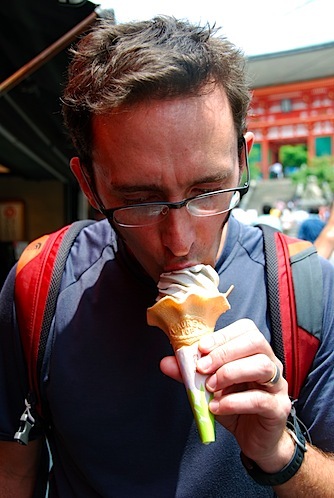 Jeremy eating black sesame ice cream. Apologies for the bad photo quality, but this thing was too good not to share. 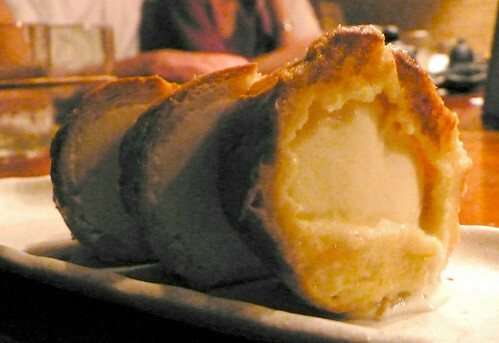 It’s called pan-ice, and it’s vanilla ice cream *inside* some slices of french bread. [Drool.] Eaten at Ichi. Kushiyaki: Grilled stuff on sticks. It’s good, and it’s inventive. Think enoki mushrooms wrapped in pork, spring onions wrapped in pancetta, grilled soy nuts, etc. Okonomiyaki: The most un-Japanese dish we tried, mostly because it’s really messy. Okonomiyaki is basically an omelette or a pancake, filled with stuff, and then finished with a bunch of toppings, sauces (ahem, Worcestershire), and bonito flakes. We weren’t crazy about this dish, but I don’t think we gave it a fair shot—we only had it at a festival fair booth. OK, not everything in Japan is haute cuisine. This one made me scratch my head and think, really?!? Really, Japan?!? Like, for real? 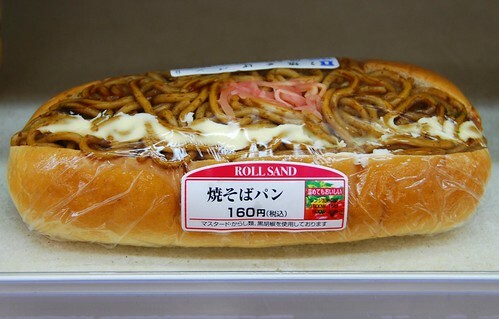 Noodle sandwich with mayo. Yum? 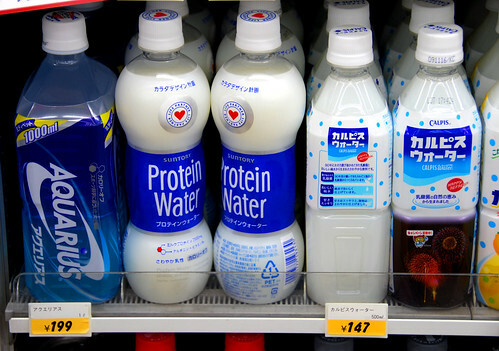 Maybe you can wash it down with some protein water? 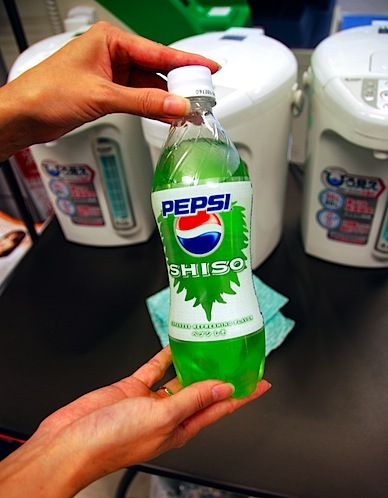 Or some shiso-flavored Pepsi? My eyes are bleeding and my stomach is ingesting itself. OMG - that food looks sooooooo gooooooooood. Thanks again for all the wonderful posts. You guys are amazing. Happy belated bday to Jeremy!